Swarms look like this. And they can land on lots of things. When you say "swarm,' this is what we hope you are seeing! As nerdy as it may seem, “swarm” means something different to a beekeeper than it does to a normal person, but we are still here to help you out. Please email dcbees@dcbeekeepers.org, call (202)255-4318 if you have a swarm like this, and we will try to collect it. For non-beekeepers, “swarm” means “a lot of bugs.” But to us, it means a specific behavior by a specific critter at a specific time. This is not a swarm of bees, this is a wasp's nest. They are completely uninterested in people if humans leave the nest alone, and they do a great job of hunting down and eating insect pests that DO bother us every day (like those tent caterpillars). Beekeepers like wasps a whole lot more than pesticides, so we would love it if our neighbors would leave these nests in place. If there is a public safety issue, however, and one of these is in a city tree or public location, you can call the Department of Health Pest Control Department. If it is located on private property, the owner will have to contact a professional pest management company. Honey bee swarms are blobs of hundreds, if not thousands of homeless, helpless, and harmless pollinators looking for a new place to live. Only the strongest colonies of Apis mellifera (we told you we were geeks) which have survived the winter and outgrown their last-year's hive will swarm. We want to catch them and give them the homes they are looking for. When we do, they have a chance to contribute to a healthier, more sustainable future for urban honey bees as we ensure that their genes are replicated into follow on generations. But swarms can land in lots of different places. As daunting as this looks, they are usually easy for a trained beekeeper to collect (if we can get to them). We have more than a dozen local beekeepers who are anxious to get bees and to get experience getting bees in this manner. If you contact us, we will dispatch a beekeeper to your location to collect these swarms. We get called for a lot of things that aren't swarms, so we will ask a lot of questions about what you are seeing when you reach out to us. Even if we determine that you don't have a swarm we can collect, we can probably tell you ALOT about what you are seeing, and whether or not you should be concerned. At any time of the year, we get calls about bees (both honey bees and otherwise) that are living inside houses, garages, sheds, or even hollows in trees. This is a different kind of project, and one that requires more expertise and planning. If you have honey bees inside a structure, we need to find you a beekeeper with special expertise, carpentry skills, and several hours of time. 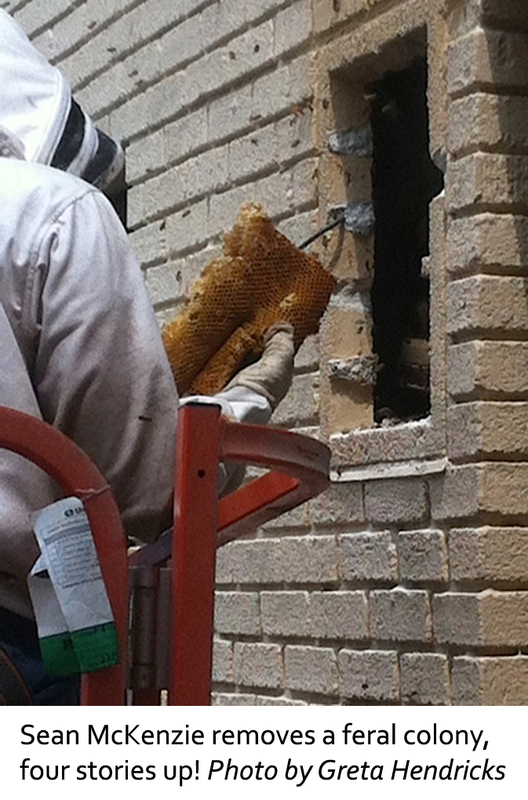 This help is not free, but reasonable agreements can be worked out in advance, and expert removal is the only way to deal with your problem (if you spray insecticide into a cavity, you are unlikely to kill all the insects, and will leave a reservoir of honey and wax inside your wall that will prove a delight to ants and mice as well as an ongoing source of moisture and leakage). It is also illegal for pest control contractors to spray honey bees, and most don't want to anyway, because they get it. For bee trees, the DC Beekeepers Alliance is delighted to work with your professional arborist to cut away and remove a section of trunk containing a wild colony, and move it off of your premises. We do this a couple of times a year as an educational activity.